Blueberries are the fruits of a shrub that belong to the heath family whose other members include the cranberry and bilberry. Blueberries grow in clusters and range in size from that of a small pea to a marble. They are deep in colour, ranging from blue to maroon to purple-black, and feature a white-gray waxy “bloom” that covers the berry’s surface and serves as a protective coat. The skin surrounds a semi-transparent flesh that encases tiny seeds. Cultivated blueberries are typically mildly sweet, while those that grow wild have a more tart and tangy flavour. Blueberries are a popular, delicious fruit. They are a good source of vitamin K1, vitamin C, manganese and several other beneficial plant compounds like anthocyanin. Consuming blueberries on a regular basis may help prevent heart disease, improve brain health and help moderate blood sugar levels. 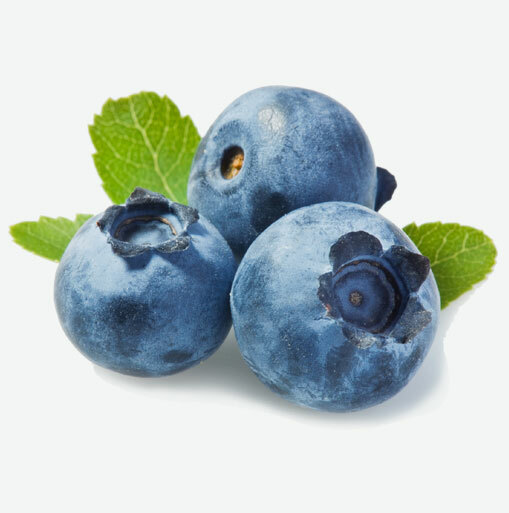 Choose blueberries that are firm and have a lively, uniform blue colour. Avoid berries that are dull in colour or soft and watery in texture (as the presence of moisture will cause them to decay). Give the container a shake to see whether the berries move freely. If they don’t, this may be a sign that they are soft and damaged or moldy. Store ripe blueberries in a covered container in the refrigerator. Here they will keep for up to three days. If kept out at room temperature for more than a day, the berries may spoil. Your berries shouldn’t be washed until you are ready to eat them, as washing will remove the bloom that protects the berries’ skin from spoiling. Fresh berries are very fragile. They should be washed briefly and carefully and then gently pat them dry. You can also spin them dry in salad spinner. Blueberries are extremely easy to freeze and store for later use! Buy them in abundance in the summer and freeze them for a batch of Sunday blueberry pancakes every now and then. To freeze, wash blueberries and remove any stems and spoiled blueberries. Arrange on a clean tea towel to gently blot dry. Transfer to a lined baking sheet and flash freeze the cleaned and dried blueberries until frozen. Transfer to an airtight container and use within 8 months. For a deliciously elegant dessert, layer yogurt and blueberries in wine glasses and top with crystallized ginger. Blueberry pie, cobbler and muffins are classic favorites that can be enjoyed throughout the year.